Which Is The Best Chevy Camaro? The 2019 Chevrolet Camaro was revealed to the world today and, well, let’s say reactions were mixed. So we’re take that as our cue and get some strife brewing by asking a potent question: what’s the best generation of Camaro? Jason Torchinsky: What does this dumbass know about Camaros? The best Camaro is the second-gen one, no question. Not a Mustang knockoff like the first, the 2nd gen had a unique, almost Italian style with big, beefy American bones. Plus that fish mouth, with a retainer-like bumper, even! THE BEST ONE. When I suggested that the 1969 model was the best of the Camaros, an editors hit me with a “boooooo,” and then proceeded to tell me I had voted for a Mustang knockoff. I do not care. 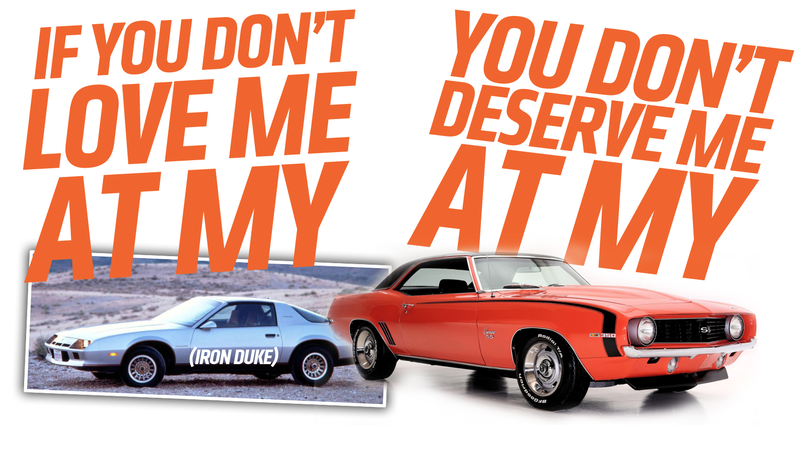 Remember when GM joined Ford and Dodge in introducing a retro-themed muscle car in 2010? Which car did Chevy use as design inspiration? The answer is the 1969 Camaro. Because clearly, it is the best. Oh, and screw Jason’s 240-character limit. That only applies to answers that are wrong. The truth does not deserve bounds. I like my Camaros like gas station hot dogs–cheap, long, dirty and liable to catch fire. I’ll never forget helping my buds beat flames out of the engine bay of an ’81 in our high school parking lot. Oh, you bet your buns the thing still ran afterwards. Late second-gen FTW. Honestly, the ‘70s Camaros are both the prettiest (early ones) and the most badass (late ones that did Le Mans), but I will shout out the big bathtub last-gens. I loathed them growing up, but now I appreciate no desirability and a stock LS.